Shower Bench Bathroom Accessories - Making your choice count towards a successful bath! many options. the right choice. Shower bench bathroom accessories - the decision can be overwhelming but critical. Most falls take place in the bathroom and the shower is no exception. Many people stop taking showers and substitute a sponge bath long before they really need to. 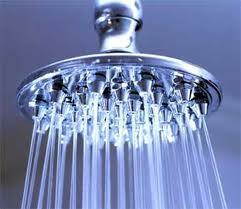 The use of water outside the body in the form of a shower or bath brings many benefits to health. Resorting to a sponge bath, while better than nothing at all, robs your body of the healing, healthful benefits of using water on the outside of the body. Consider the following benefits of bathing before you rule out finding shower bench bathroom accessories to meet your specific needs. A cool or cold bath is an excellent tonic and can tone up the skin. Warm baths relax and open the pores for cleansing, improve circulation and soothe the nerves. Baths help respiration to become more free and easy. Bathing helps the bowels, stomach and liver - strengthening the entire system. Mustard added to water for a foot bath with relieve a congested head. Soft flannel clothes wet in hot water and salt will relieve painful, inflamed eyes. Many don't know how to make their shower experience safe. While the benefits of water and soaking in a hot bath rank high in our early years when strength and perfect balance was not a concern, weakness, instability and a number of other ailments stop some short of stepping in. Among other items, being able to sit down can bring back the joy and benefits of showering in a luxurious stream of water or even in a bathtub full of water! It is possible but sometimes possibility comes with a price tag. Shower bench and bathroom accessories are not only a convenient accessory but are also essential for a safe, beneficial bathing experience. They come in all shapes and sizes, overwhelming and confusing the buyer. Let's narrow the options down a bit to the shower bench bathroom accessories that fit your needs. Shower Bench Bathroom Accessories - finding your fit. Simple seat, legs adjust up and down based on height and ability but no back or arms. Good for walk in showers or small showers/bathtubs. Can be turned side ways if absolutely necessary. Simple seat with back rest, no arms, legs adjust up and down based on patients height and/or ability. Good for walk in showers or small showers or bathtubs. Simple seat with back and arms, legs adjust up and down based on patients height and/or ability. Seat and back may be cushioned. Transfer shower bench. ONE arm and a back (and optional accessory's)and is designed to fit two-thirds in the tub and one-third outside the tub. This allows individuals who are non-weight bearing or unable to step up and over the tub wall to simply sit and scoot in. Legs are adjustable. Adjustable for a shower facing either way. Seat and back may be cushioned. Various optional accessories. Shower curtains can be tucked underneath the user or a "box" shape can be cut out to fit over the bench (more water ends up on the floor though!) This option does not work with glass doors or small bathrooms. Transport shower commodes - popular in nursing homes and rehab units due to it's ability to roll on wheels fairly easily. 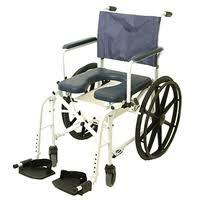 Home owners use these if they have a large wheel in/walk in shower designed specifically for a patients needs. Patient does not need to get off transport shower commode. It triples into transportation, shower chair and commode. Nice for non-ambulatory patients (those who can not walk). Your best, and cheapest option? Your plastic patio chair. Nope, not medical equipment but cheap and functional. It's not adjustable but it is cheap, has a back and two arms and is comfy. It's up to you to make it safe. Use your better judgement! Be sure to put two bath mats under all four legs to ensure no slipping as there are no rubber tips on these chairs. Another simple option and affordable is your folding mesh shower chair. Folds into about 2 inches wide and only weighs 4 pounds. Mold resistant. Non slip rubber feet unsure a safer bathing experience and protect your tub finish. Convenient, one-piece bench has a comfortable, contoured seating area. Portable for easy storage and travel. Easily adjustable, the seat fits standard tubs 19" to 28" wide. Rubber stops help protect your tub. You need to have a good lip on the wall side of your tub for this seat to have ample "clamp room. Adjustable underneath the bench to "lock" it into place. I love these! After choosing your shower bench bathroom accessories, make your bathing experience even safer with Grab bars. It may seem simple to figure out what type of shower bench you need for the ability of the user. However, this may not always be so clear. If you are still unsure what choice is the best, you can always ask a question in the forums, contact your local home health agency or consult with me directly. No two bathrooms are alike and no two patients are alike either. If you find it still impossible to access the right shower bench bathroom accessories, sponge baths can also bring healing benefits to a diseased, sick body. Another option in the shower bench bathroom accessories family that could help in tough situations is the transport shower commode - serving several purposes in one piece of physical therapy equipment! Your Third Arm! Like Your Own Personal Assistant! What Bedside Commodes Fits Your Needs Best? Consider home safety before your physical therapy equipment purchase. Gait Belts Save Lives In The Bathroom! Easiest Proven Way To Get Out Of A Chair! Copyright © home-health-care-physical-therapy.com | all rights reserved.